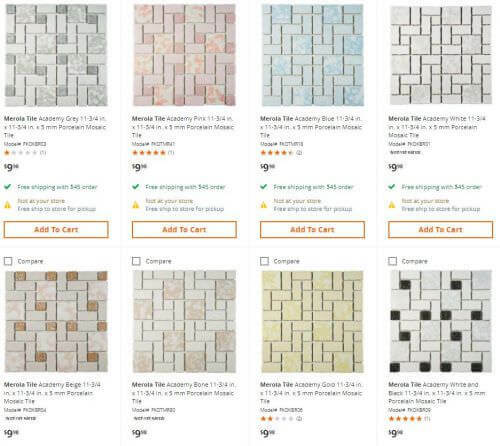 Elizabeth wants 1960s style mosaic floor tile for her bathroom remodel, and when she asked us for help choosing between her two selections, several readers suggest other mosaics. I’ve written about all those mosaics before, so I decided to put all the options we know of into one story. 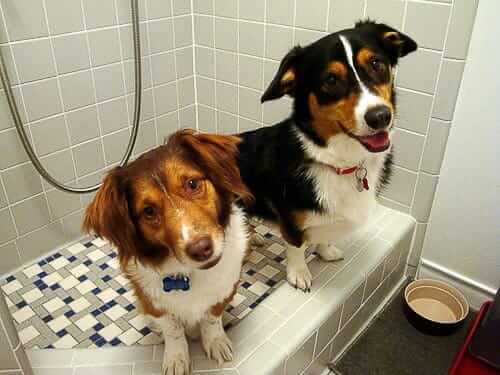 Above: Nicole and Graham used Daltile’s Mosaic Tile Designer to create their own mosaic tile floor for their laundry room and yes — dog shower! Merola Tile University Tile was the first tile we discovered. It is a classic “random mosaic” pattern of 1 x 1, 1 x 2, and 2 x 2 tiles. When we first wrote about this tile in 2012, the company told us it had been in production in the same Indonesian factory since the 1970s. There are six colors in all. Kate used the pink in her pink bathroom. You can buy these tiles on Home Depot’s website. 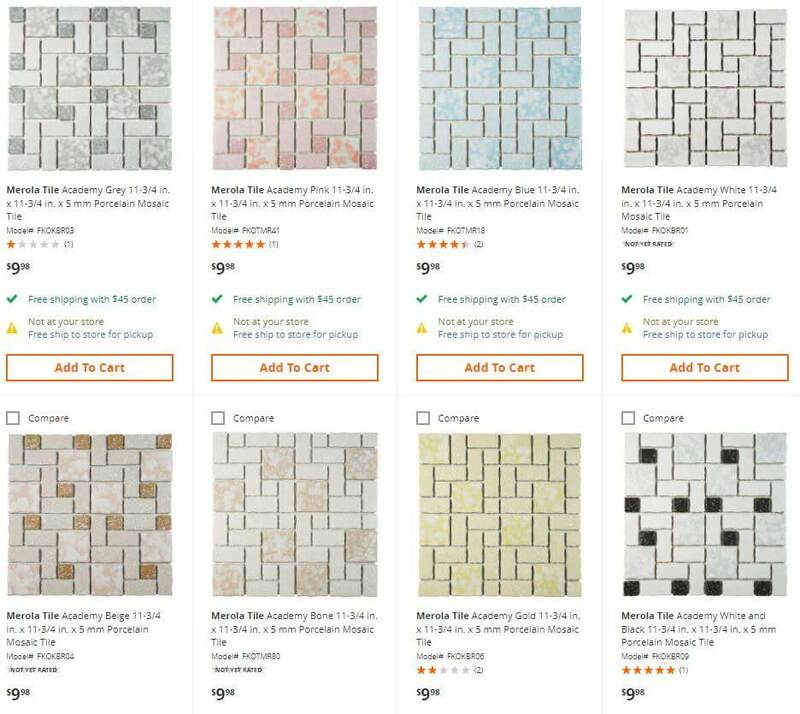 Merolo also offers its “Academy” tile design in similar colorways. The main difference seems to be that Academy have a wavy, rather than straight, edge. Also available at Home Depot. And, they have the 1×1 (ish) Chrystallines. Kate used the Pistachio on the floor of her green bathroom. Get ’em from Home Depot. 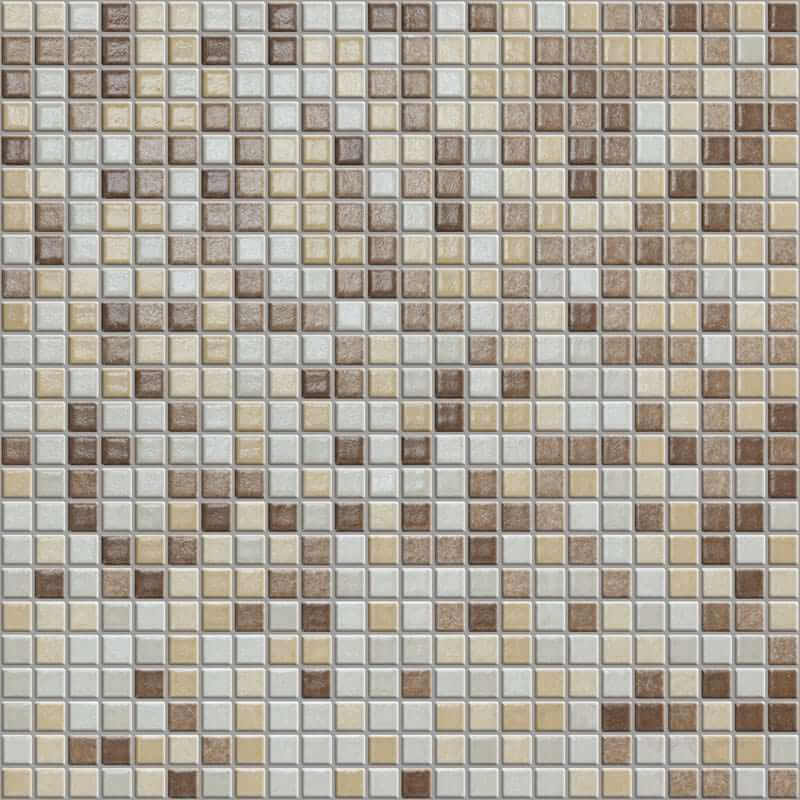 Classic Tile has a pretty amazing selection of mosaic floor tiles overall, including the two speckled 1960s styles, above. Their 1x1s and random mosaics look to be same as the Merolas. 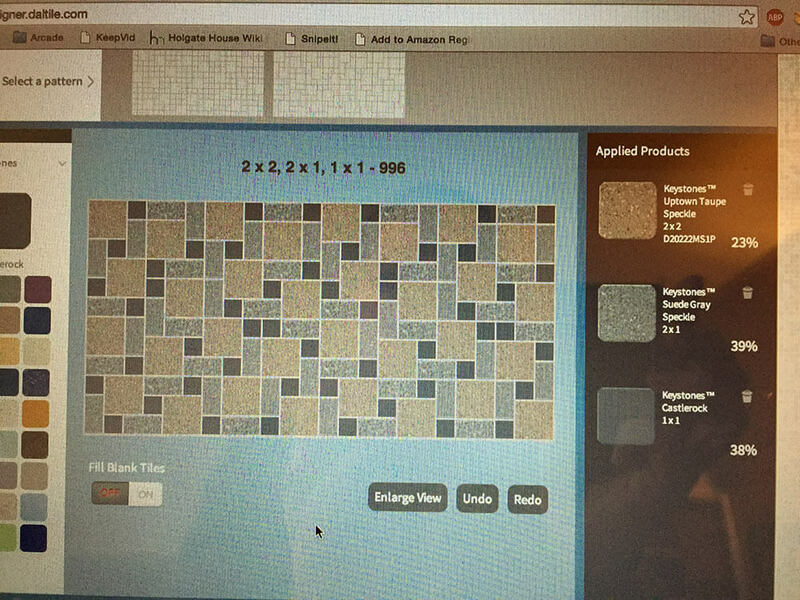 Colors may vary; I am going blind looking at mosaic floors. 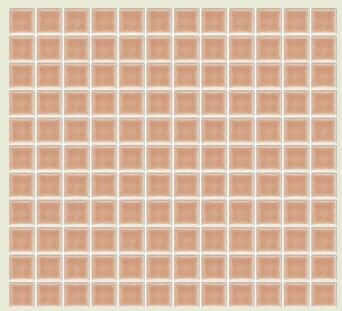 As of this publish date, these tiles start on page 9. Prices shown in the graphic above are from our 2015 story, they may well have changed. Studio Tile imports the “Cinca” line from the same factory in Portugal that’s been producing it since 1964. Available in 24 colors — talk to owner Lisa about how you’d order a random mix. 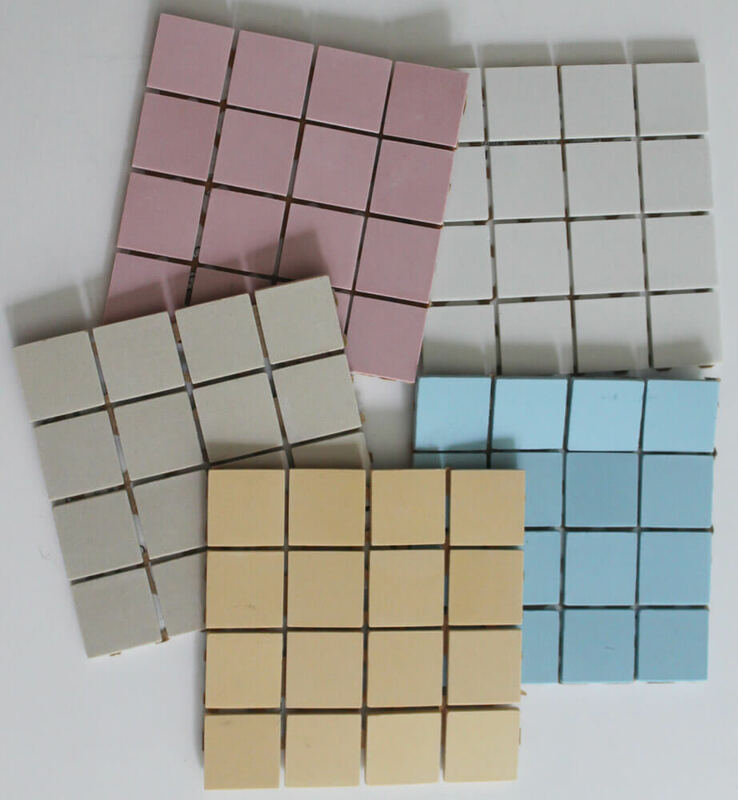 …Is another place you can get glazed, matte and unglazed porcelain tiles in a variety of colors. 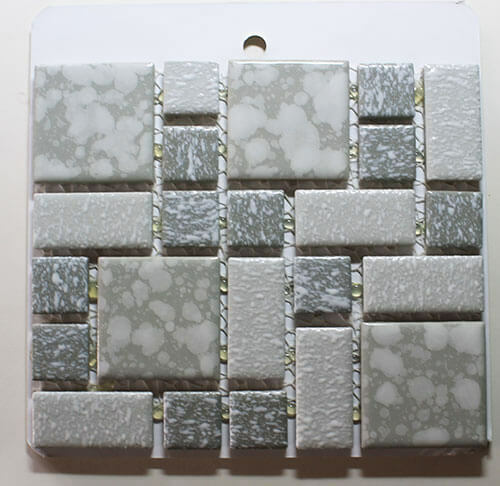 To get a mosaic, you would, for the most part, have to mix and match your own design ala the Daltile Pattern Designer. 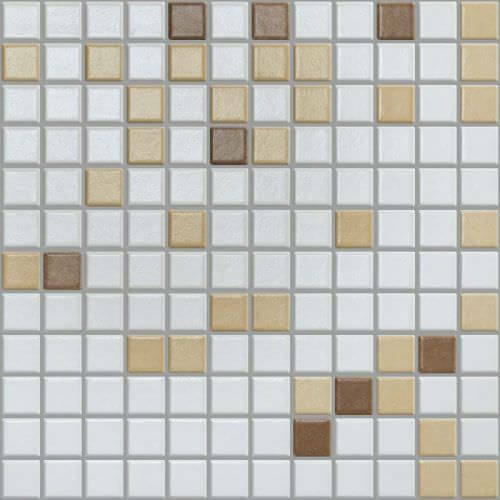 Mosaic Tile Supplies also has a lot of basic small squares that you can pop into their octagon and dot patterns for different looks. 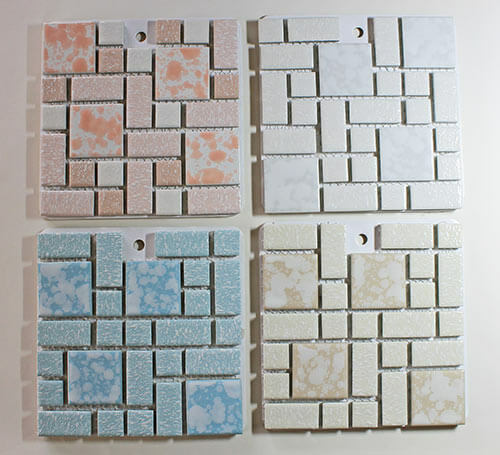 These mosaic mixes available at Nemo Tile are gorgeous. I’d consider certain colors for a sophisticated 1960s look and use Nemo’s matching field tile. Reader Rebecca used these tiles in her bathroom gut remodel — she even had them mud-set! 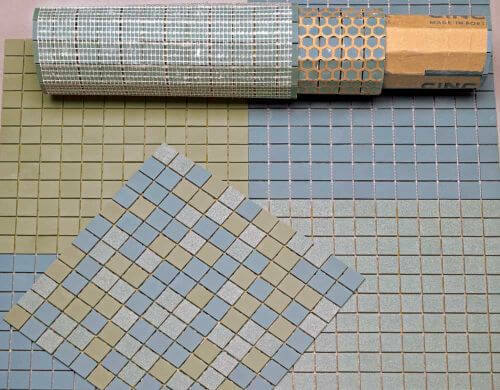 We’ve had a few readers — like Lauren, and Natalie and Graham –use Daltile’s Mosaic Pattern Designer to create their own mosaic mix floor. If you are going to use this option, plan plenty of lead time, as it’s made to your specific order. Also take the url with you to the store, because stores may not even know about this. Or, like Nicole, you can do “some therapy” and not wait 10 weeks and get the its and bits and piece the thing together yourself. UPDATE 2018: This Daltile feature now seems to have been deactivated. Boo hoo. 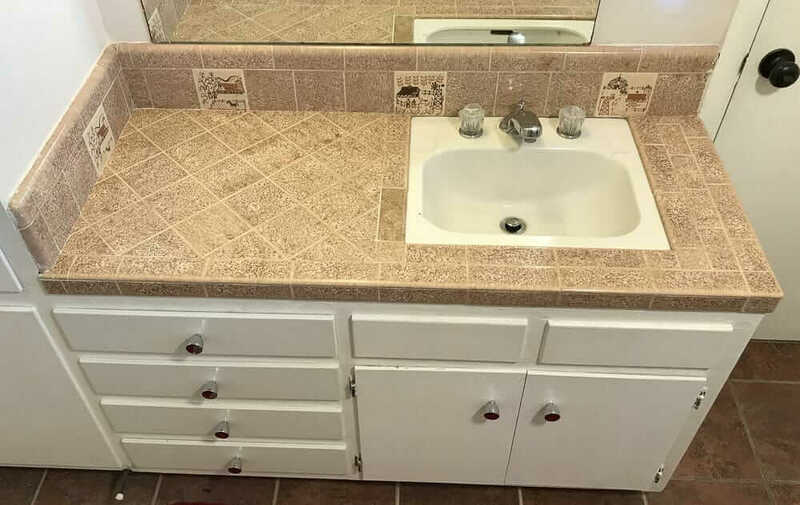 Do you need a few places of replacement tile? This will likely take some time, as there were so many brands, so many colors, but start hunting hunting hunting for vintage. For places to look, see this story and focus on the vintage sellers. Want more ideas on bathroom tile? See our Bathroom Help / Tile ideas category here. 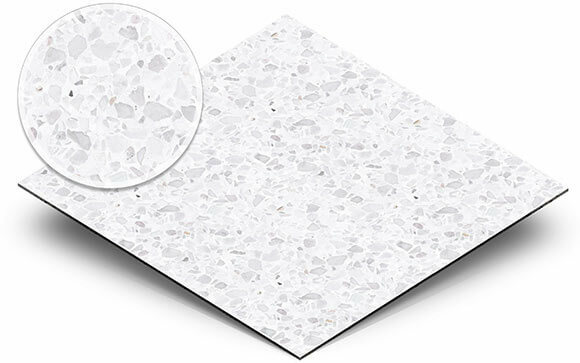 Also remember, when working on floor tiles, consult with a pro to ensure they are specified correctly for the usage you have in mind. Let me know if you find any more sources for colorful mosaic floors 1960s-style! 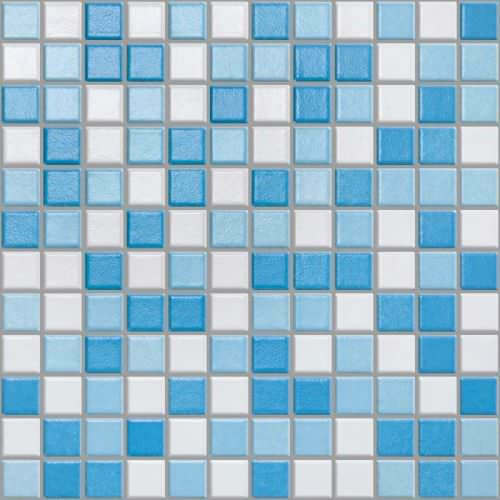 Lauren’s bathroom makeover story and “3 ideas for Angela’s aqua bathroom design” were how I learned about Daltile’s pattern designer and I pretty much copied those almost exactly in 2 of my bathrooms. 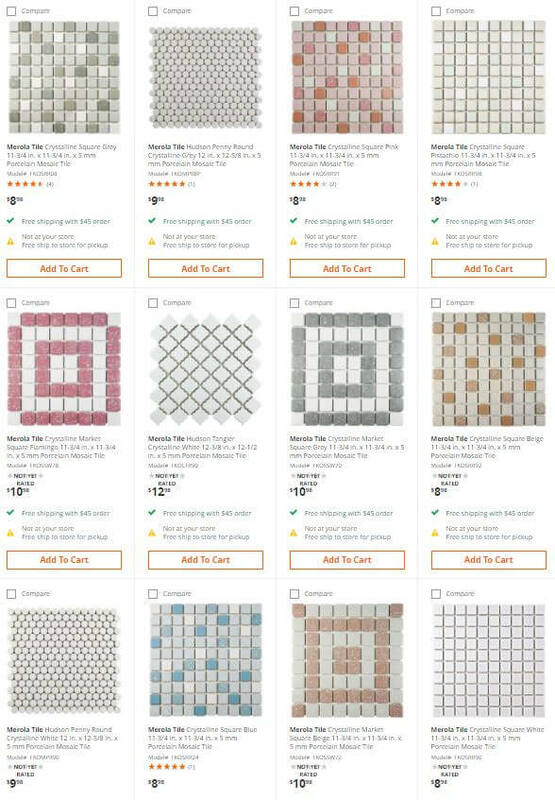 And yes, the store where I ordered from was like “huh, I didn’t know we could even do this!”, but they were awesome and my floors came out perfect (even if they did try to talk me out of blue tiles because “no one wants blue anymore, think of the resale value!”). One of the original residents of my home recently stopped by when she was in town for her 50th high school reunion and it took her a minute to realize that the floors were brand new, not the original floors she remembered from her childhood. And now she’s been texting me pictures of the house from when she was a kid so I can see what it all looked like in the 50s and 60s. Do you have any advice on where to find the wall tiles? 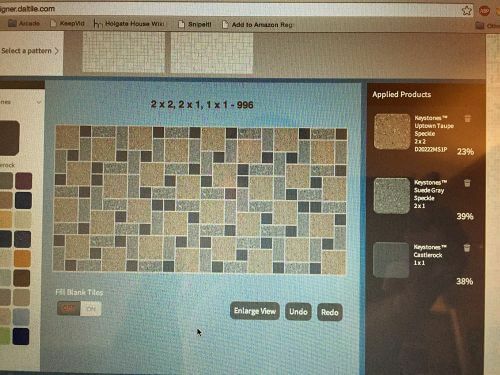 Is it possible that the Daltile Mosaic Tile Designer doesn’t exist anymore? 🙁 I Can Not find it!